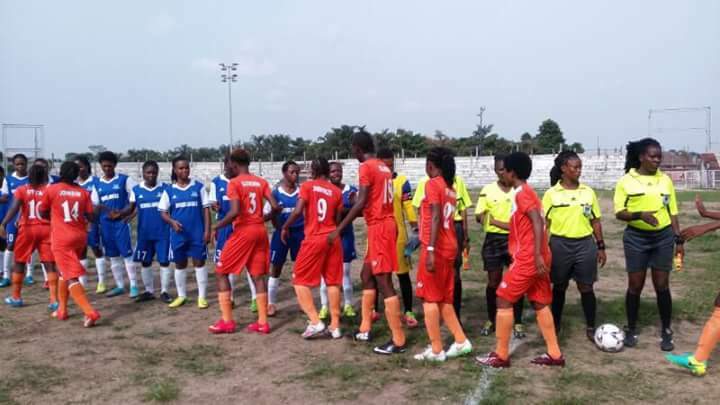 A late Charity Reuben strike secured a point for Ibom Angels against Rivers Angels on Wednesday. Alice Ogebe put the champions in front 25 minutes into the second half, but a late penalty ensured a share of the spoils. Edwin Okon’s side- starting with six internationals in the form of Tochuckwu Oluehi, Ugo Njoku, Osinachi Ohale, Onyinyechi Ohadugha, Glory Iroka and Chioma Wogu- needed only five minutes to remind the hosts what they’re capable of, with Alice Ogebe hitting the side netting after latching onto a through ball. And there were further threats before the end of the opening half largely controlled by the Port Harcourt club. Chinasa Uchendu forced goalkeeper Lucky Andy into a fine save and Alice Ogebe turned past her marker before sending a dangerous cross into a crowded box. Ibom Angels, though, produced a vastly- improved second half as Ogbonda Whyte made some tactical changes. Few seconds after the interval, Oluehi needed a fine save to keep out Blessing Okpe’s brilliant freekick. The Nigeria international also pulled off a magnificent save to deny substitute Emem Essien. On 70 minutes, the hosts were stunned, when Ogebe took advantage of Happiness Titus’ sluggishness to head past Lucky Andy. Substitute Charity Reuben, however, almost immediately put her side level. Taking the feed from playmaker Celine Ottah, the striker sent a fierce shot towards goal, only for Oluehi to save. Late on, Ottah was kicked in the head, leaving the referee with no choice but to point to the spot- and Reuben did the rest.